It's probably because I don't teach any more (although as depressing as it was to see school supplies in the stores in July, getting all set up for a new year as always one of my favorite things to do as a teacher! ), but I can't help but get a bit giddy when I see all the notebooks, folders, crayons, pencils, backpacks, etc... hitting the shelves. I had a doctor's appointment for my pregnancy a few weeks ago, and my husband watched my boys. And I can't go to Orem by myself without swinging by Target. Target, all by myself- a happy place! Anyway, I ran across these darling Dr. Seuss folders for $1 each. I don't know if it's my boy's school, or just the fact that they're young, but they never really need folders. I always want to buy them because they have such cute ones, but I've bought them in the past, and they've just sat in their backpacks all year. 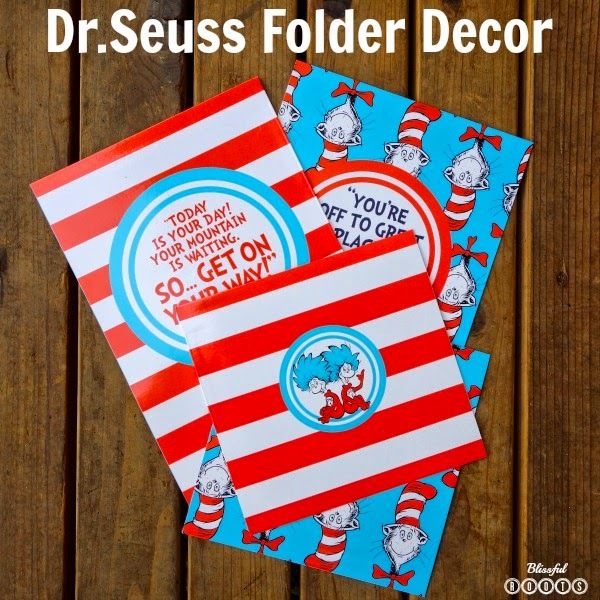 So, I decided to buy the Dr. Seuss folders anyway, and use them as decor instead. This red striped one had the quote on the front, and then Thing 1 and 2 on the back. I just trimmed off the side of the folder for the front image, and then had to cut the side and bottom off the back image because of the bar code and what not. But I actually love the two different sizes! Then here's the other folder I bought. I did the same thing with it, cut it down, and instantly had two great pieces of decor for my boys' room. Folders are really quite durable, especially if they're just hanging on a wall. They're made of thick paper, and always have a nice finish to them. Great for great looking art! You can't beat a Dr. Seuss quote! I love how positive and upbeat they always are. So, next time you're in the folder isle of your local store, see what you can find to use not only for back to school, but also for decor. I think you'll be surprised at what you can find for just dollars.